By Mary Ellen Bogucki, mother of Special Olympics athlete Breanna Bogucki. This story originally appeared on SpecialChronicles.com. Driving up to the Los Angeles Memorial Coliseum and Sports Arena was surreal. This suburban mother from Illinois had no preconceived notion of what to expect. At the risk of being ridiculed, I will even admit that I had no idea it was the stadium of the University of Southern California. I like football, honestly I do, but I only know a little about college football and that little involves colleges only located in the Midwest. The stadium architecture was impressive and almost monumental. As I stared at the Olympic rings located on top of the entrance, the magnitude of why we were there took my breath away. We would be attending the Opening Ceremonies of the 2015 Special Olympics World Games. As the mother of a Special Olympics athlete, I can tell you what a thrill it was to be standing outside the gates of the stadium for such a memorable event. For a Special Olympics athlete, it is quite an achievement to qualify for their home State Games. To be chosen for a National or World Games, that is something most athletes only dream about. Special Olympics has over 4.5 million athletes competing, which makes being chosen to compete in a National or World Games a huge honor and a very rare one at that. I would not be attending as the mother of a competing athlete this time. I was there to watch my daughter Bree sing as part of a special project developed by Coca-Cola, a founding partner of Special Olympics. Coca-Cola brought together Marc Roberge of O.A.R., Cody Simpson, Madison Tevlin and Bree to sing the Special Olympics World Games Anthem “Reach Up.” Just like those competing in the World Games, being chosen for such an incredible opportunity was a huge honor and a very rare one, too. I think one of the most wonderful occurrences that repeatedly happened during the Games was the gathering of people. For just the Opening Ceremonies, gathered together in one arena were Special Olympic athletes, the First Lady, famous musical artists, Hollywood actors, Olympic athletes, coaches, police personnel, families, friends, and the list goes on and on. People gathered together to celebrate unity, inclusion and the acceptance for all. 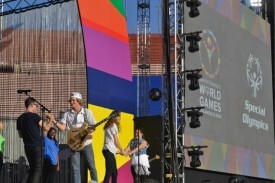 Bree will tell you it was amazing performing at and attending the World Games. The word she uses to describe the experience is “indescribable.” “There are just no words to describe how incredible it was,” Bree would tell you. Before we left UCLA, Bree had a blast visiting the Coca-Cola tent, where she tried different Coke products from around the world. Her favorite drink was Bibo from South Africa. She posed for pictures in front of the “Reach Up” poster and had fun being recognized. One of our greatest honors we experienced was meeting Tim and Maria Shriver. To be able to thank them for changing the lives of so many including Bree was a blessing. Mary Ellen is a married mother of three who still believes a pebble can start a ripple that may change a life. She enjoys spending time with her family and cheering on her kids in whatever activity they’re involved in. She believes in advocating and educating for those with special needs. She often spends way too much time cleaning up after the multiple dog and cats her family rescued. She always has a story developing inside her head, and sometimes she sits down long enough to document it. When all else fails, she listens to lots and lots of music.